Functional reactive programming, or FRP, is a style of programming based on two key ideas: continuous time-varying behaviors, and event-based reactivity. FRP is the essence of Fran [1,2], a domain-specific language for functional reactive graphics and animation, and has recently been used in the design of Frob [3,4], a domain-specific language for functional vision and robotics. In general, FRP can be viewed as an interesting language for describing hybrid systems, which are systems comprised of both analog (continuous) and digital (discrete) subsystems. Continuous behaviors can be thought of simply as functions from time to some value: Behavior a = Time -> a. For example: an image behavior may represent an animation; a Cartesian-point behavior may be a mouse; a velocity-vector behavior may be the control vector for a robot; and a tuple-of-distances behavior may be the input from a robot’s sonar array. Both continuous behaviors and event-based reactivity have interesting pro erties worthy of independent study, but their integration is particularly interesting. At the core of the issue is that events are intended to cause discrete shifts in declarative behavior; i.e. not just shifts in the state of reactivity. Being declarative, the natural desire is for everything to be first-class and higher-order. But this causes interesting clashes in frames of reference, especially when time and space transformations are applied. 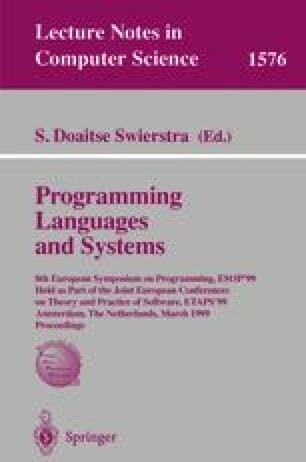 In this talk the fundamental ideas behind FRP are presented, along with a discussion of various issues in its formal semantics. This is joint work with Conal Elliot at Microsoft Research, and John Peterson at Yale.